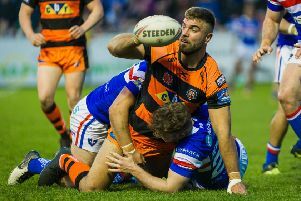 Castleford Tigers boss Daryl Powell is happy with the way his team's new half-back partnership is developing. With Luke Gale out for the season and Jamie Ellis currently sidelined the Tigers head coach went with Jake Trueman and Jordan Rankin in the halves in the opening game against Catalans Dragons and was pleased with their contribution. He said: “I thought they were very good. "Jordan has fitted in so well. He is a really good fella and he studies the game, he really loves rugby league. “He is going to get better with how we play the game. He keeps slotting into what we’re doing and we find out a bit more about him every session and every game so I see him being a fantastic signing for us. “Truey’s completely different, he’s quiet, unassuming, does his job. He’s playing so well and improving every game. "I think it’s a good contrast combination, which you like to have with your half-backs. You don’t want them both the same. Powell praised his forwards for their efforts against a big Catalans pack, particularly Liam Watts who played big minutes in an eye-catching display. He added: “With the ball I thought our yardage was fantastic, we went forward so well. “Liam Watts was immense. He's pretty fit and had a massive game and our pack was a real stand out. “It’s always the same, you need to front up in the middle. That’s where the physical battle takes place.